In the Catskills there are thirty-five peaks that are over 3,500 feet in elevation and are noted in the Catskill 3500 Club. The Catskill 67 are the next highest peaks in the Catskills, of which, 63 are over 3,000 feet in elevation. These peaks are featured in a hiking guide, The Catskill 67 , a recommended book from the ADK Mountain Club. Stoppel Point at 3420 feet is the 45th highest point in the Catskills, or #10 for the Catskill 67. To reach Stoppel Point features a hike along the overly popular Escarpment Trail. This mountain is located north of the busy North-South Lake State Campground. The shortest route to Stoppel Point is via Mary Glen Trail to the Escarpment Trail from a small parking area near the trailhead along the main road in the campground. The GPS coordinates of the parking area is N42 12.271 W74 02.353 for those who have a GPS devise in their vehicle. There is a day use fee to enter the campground for those not camping. From the small parking area, walk toward the campground entrance over the culvert for Ashley Creek. The start of the Mary's Glen Trail is on the right at the DEC sign. You are following red DEC plastic discs and there is a register almost immediately. The start of the trail tends to be muddy and wet. At 0.2 miles reach a junction. The trail to Ashley Falls goes straight, while the red marked Mary's Glen Trail turns left and begins to climb. The waterfalls are just a short distance away and are worth checking out. The trail to the falls is marked with yellow DEC plastic discs. Mary's Glen Trail now ascends steeply toward the top of the waterfall. The trail will cross Ashley Creek and a short bushwhack to the right will bring you to the top of Ashley Falls. The main trail reaches the junction of the Rock Shelter Trail at 0.5 miles. To the right the Rock Shelter Trail goes 0.5 miles to the Escarpment Trail. Mary's Glen Trail turns left, briefly following Rock Shelter Trail for about 500 feet before turning right. The Rock Shelter Trail goes left for 1.3 miles to the Schutt Road Parking area. Soon the Mary's Glen Trail begins to ascend steeply on a very wet trail. At 1.3 miles Mary's Glen Trail reaches the Escarpment Trail. To the right the Escarpment Trail travels 2.8 miles to the picnic and parking area at North Lake. Turn left and now follow the blue marked Escarpment Trail, which coincides with the Long Path. After steeply ascending, in 0.2 miles reach North Point. There is an open ledge just prior to reaching North Point with a spectacular view back toward North-South Lake. There are better views from North Point. It is 1.8 miles from North Point to Stoppel Point along the Escarpment Trail/Long Path for an overall one way hike of 3.3 miles. There are more nice views from Stoppel Point, however the best views are from North Point along this stretch of trail. For those who do not want to pay the entry fee to the campground can park at the popular Schutt Road Parking Area just outside the campground entrance. This parking area fills quickly and you'll find cars parked all up and down the side of the dirt road on weekends as well as holidays. The GPS coordinates of the parking area is N42 12.064 W74 03.487 for those who have a GPS devise in their vehicle. Follow the Rock Shelter Trail to the junction of the Mary's Glen Trail and then follow the above route. This route adds another 0.8 miles to your hike, making this a 4.1 mile one way hike to Stopell Point. 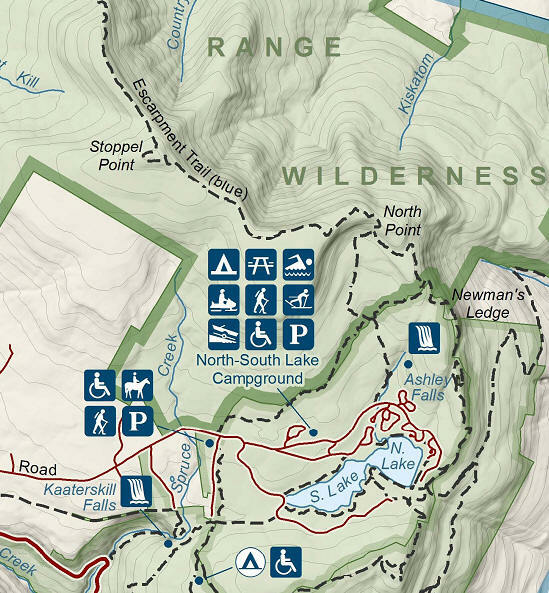 Stoppel Point is located in the Windham Blackhead Range Wilderness of the Catskill Forest Preserve. To get more info on this hike and other Catskill 67 hikes, we recommend purchasing the hiking guide The Catskill 67. The book gives more info on the routes to this mountain. 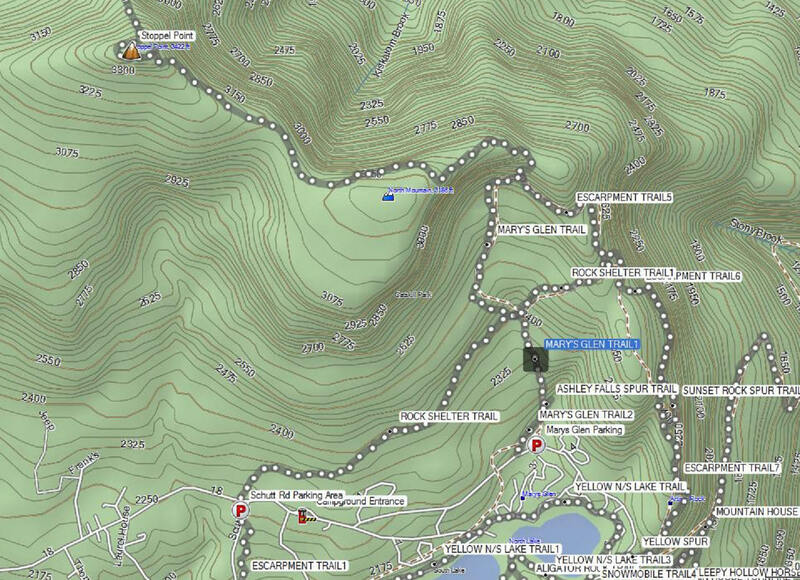 Look below for a DEC map of Windham Blackhead Wilderness and a topographic map of Stoppel Point to help assist in planning your hiking adventure.